L-Tron Corporation announces their 2018 conference schedule, with plans to travel to several states as well as sponsor a Forensic Photography Training. 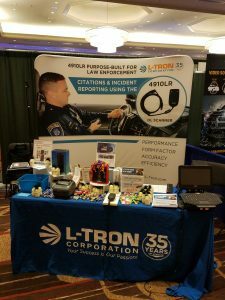 L-Tron's booth at a 2017 law enforcement event. VICTOR, N.Y. - April 16, 2018 - PRLog -- L-Tron Corporation has announced its 2018 schedule for exhibiting at law enforcement conferences across the United States. The company will exhibit its 4910LR Driver's License Reader for electronic ticketing (eCitation), as well as its OSCR360 Solution. The Empire State Law Enforcement Traffic Safety (ESLETS) Conference will take place in New York State from May 3-4, 2018. The IAI (International Association for Identification) Forensic Educational Conference (https://theiai.org/conference/index.php) will take place July 29- August 4, 2018. The Symposium on Traffic Safety (https://iptm.unf.edu/symposium/) will take place in Orlando, FL from May 21-24. The New York State Highway Traffic Safety Symposium (http://www.safeny.ny.gov/hs-symposium.htm) (Stop DWI) will be held in Lake Placid, NY from October 15-18, 2018. The Pennsylvania State Police Traffic Reconstruction Seminar will be held in Gettysburg, PA from October 31- November 2, 2018. L-Tron also hosted a Forensic Photography Refresher training course in the Rochester, NY area this April. L-Tron will have numerous giveaways at each conference, including L-Tron swag. L-Tron welcomes all feedback from the law enforcement community, as all of our equipment is built from your voice, helping us to develop the products officers need. We hope to see you there!